I know very little about my English roots. All I know about my London families are that my Great Grandfather, Alfred Gascoyne, worked with his father, Henry, in their hairdresser/tobacconist shop in Forest Gate until Alfred went off to fight in WWI. Alfred met his wife Ada Beckwith when she came to work in the shop. Alfred was wounded in WWI and died several years later from his wounds. The shop was bombed flat in WWII. Ada was left to raise her three sons alone. Her eldest son, Alfred, died very young of infected wounds recieved as a result of being flogged after being caught smoking when he was in the Navy. 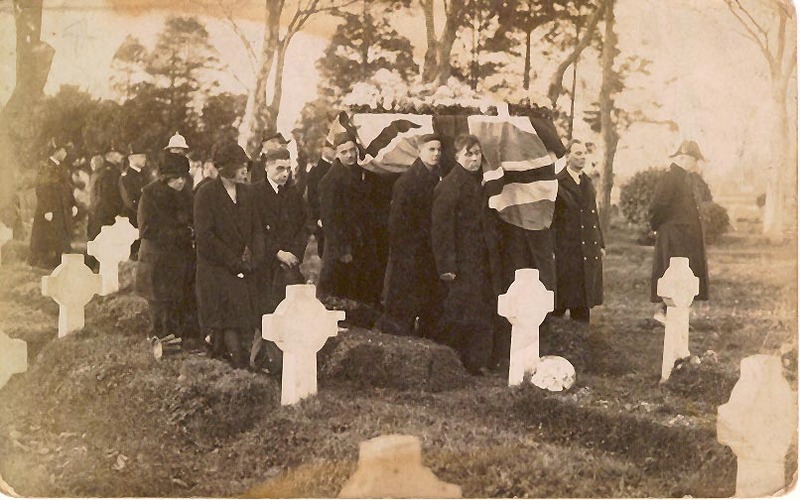 A photo of his funeral is pictured on the right. My Nottingham/Rutland families are still a puzzle that I am trying to solve. Richard Sheridan Wardley was possibly the illegitimate son of Richard Brinsley Sheridan if family legend is to be believed. I have no proof of this yet. His daughters birth certificate said he was a GP. The Medical Directories also say he was a GP, but the Universities where he claims to have studied have no record of him ever studying there!